Father's day was wonderful this year. We celebrated early because David had to fly out to California on Father's day. (phooey!) If you read my husband's blog, you know that he has lost a great amount of weight and has developed a much healthier way of living. Well, this is awesome in most areas. But, if you go to the pool in a swimsuit that you wore 25 pounds heavier, you might experience some issues:) Let's just say, after sliding down a water slide with one of the kids, he discovered that a new swimsuit was a necessity not a luxury. Here are a few pictures of David and his kids. They are so blessed to have David as their father. He loves the Lord, loves me, works super hard at his job so that I can stay home with the kids. We are so thankful for him in our lives! I love you honey!! Cool pictures. 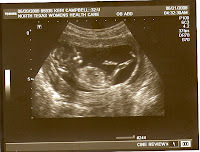 Love the sonogram...when is the baby due?? Did I miss that post. You have to be a bit along for such a great outline of him/her. Talk to you soon. What a sweet tribute to David.